Unless you live within an hour of Hocking Hills, it’s likely you’re trying to plan a weekend getaway. With so many trails, waterfalls and sights to see, I’m going to share some tips and tricks to help you make the most of your time. Tip #1: Create your itinerary before getting there. There are large areas where you will have absolutely no cell service. Unless you are staying in a cabin with Wi-Fi (which we didn’t), you will need to plan ahead. While there are plenty of directional signs, I felt much more comfortable having print outs of the maps and trails we wanted to get to. We stayed at one of the Good Earth Cabins. I’ve included our itinerary below if you’d like to reference when planning your trip. We spent all day Friday and Saturday there and left Sunday morning. Friday: We started at 9 a.m. The hike is roughly 6 miles roundtrip. It took us about three and a half hours with food breaks and stopping for photographs. This hike is roughly 1 mile. It took us about an hour and a half. We were moving pretty slow at this point, as the 6 mile hike was pretty exhausting. Saturday: I started around 6 a.m. to photograph areas without the crowds. However, we started hiking around 10 a.m.
We were pretty sore, so this was a good place for us to start. The hike is relatively easy. It’s about 1/2 mile. It took us roughly 45 minutes. This hike is short and easy, about 1/2 mile from the parking lot to the falls. We stayed for a bit and hiked up the upper rim. We probably spent roughly an hour and a half here. This is where we finished our day. We hiked the rim trail, which is 2 1/2 miles. It took us a little over 2 hours. Tip #2: Go in the off season, if you can. My first trip to Hocking Hills was in early April. Even then, it was pretty crowded on Saturday. However, I’ve been there during the middle of the summer and it can be a zoo. There are some trails that have narrow paths. At one point we had to wait for about 5 minutes to let a slew of people down the path before we could get through. Tip #3: Take advantage of early mornings (especially if you want to photograph). I visited the most popular areas between 5 – 9 a.m. and it was pure bliss. The only other people I ran into (a total of 10) were runners, fishers (by Rose Lake) and other photographers. It was quiet and people-less. Perfect for capturing long exposure shots of the waterfalls. Below is a few shots of Rose Lake in the morning. It was incredibly peaceful there. Tip #4: Also take advantage of dusk. I was surprised by how few people we saw when the sun started to set. We hiked Conkle’s Hollow Nature Preserve right before sunset and it was incredible! I love when the sun is descending down and hits the tree line just perfectly. This area would also be amazing to visit when the leaves change in the fall. It was completely bare when we were there. Tip #5: Enjoy hiking the trails, just as much as the destination the trails take you to. For example, there are some really amazing sights to see on the hike from Old Man’s Cave to Cedar Falls. You follow along the water most of the way, which is a unique blue color. There are also some unnamed waterfalls that I really loved. Plus, people didn’t spend much time in these areas so it was easier to sit there and enjoy. Tip #6: Bring food and water! I know this seems like a no brainer, but the first hike we took we forgot food and we were famished by the end. Pack some small sandwiches, granola bars and trail mix. You will want to keep up your energy, especially if it’s warm out! 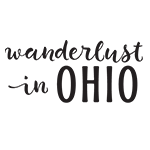 I hope these tips and tricks help you when planning your next trip to Hocking Hills. It’s such an incredible park to visit, so I would highly recommend going! There were times when I looked around and completely forgot we were in Ohio. It’s a unique terrain that you won’t find in many other places in the state. My husband and I are taking a trip there this weekend! Thanks for the tips! It was SO NICE to know how long it took for you to walk each.